This weekend, I had the opportunity to go up to Split Rock to do some walking around. Of course, the grounds of the old quarry and munitions factory are always there, just in my backyard. My suburban neighborhood in Fairmount is situated just to the north of the old Semet Solvay works, and I can get up there in less than twenty minutes’ walk. While most have heard of the famous 1918 explosion, fewer people know that virtually all of the stonework on the Erie Canal in Onondaga and Cayuga counties (and Rochester) was cut from this quarry during the canal’s 1830s enlargement period. If you see an old lock or aqueduct today in the CNY area, you may notice how the limestone all looks the same and has been extremely durable compared to other old parts of the Canal elsewhere in the state. That’s our good Split Rock limestone. But visiting Split Rock isn’t totally a walk in the park, since it isn’t one. Another danger is the terrain itself, which was a quarry starting in the early 1800s (and some companies still quarry crushed stone there today) and a munitions factory in the early 20th century. This is not an area you want to be caught in after dark, as irregular drop-offs and cliffs of considerable height have been carved out of the limestone. Some of the quarried depressions also have a tendency to fill up with water. That water is undoubtedly contaminated by the various nasty substances still in the soil from the TNT factory days. Again, not something you want to be splashing through in the night. Lastly, while you’re not likely to get cancer from an afternoon at Split Rock, it’s true that it was a dumping ground for waste and garbage for almost 100 years. Human waste from the factory was dumped regularly onto the ground, and some of the houses near the quarry didn’t even have proper sewage systems until very recently when the DEC threatened the homeowners with huge fines. Time eventually heals all wounds, but keep in mind that a century ago this place was foul, noxious and highly explosive. If your picnic lunch falls on the ground here, the “five second rule” really ought not be observed. So much for the warnings and disclaimers. The contaminants in the ground (not to mention the giant gouges in the earth) are undoubtedly what is keeping New York State and Onondaga County from developing or selling these properties. It makes one wonder why the state doesn’t just clean the place up. But paradoxically, this blighted landscape is also home to one of the rarest plants in America, the American hart’s-tongue fern. 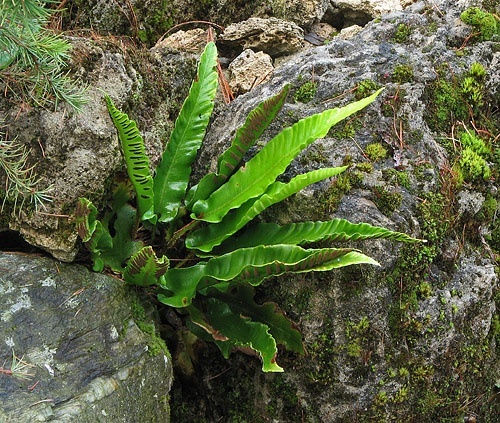 I didn’t see the hart’s-tongue fern during my visit this weekend, but it is not hard to tell where it might be hiding. On the north-facing slope of the deep gully known as the Gulf, which is skirted by the railbed of the former Auburn and Syracuse Electric Railroad, the mossy, cool microclimate is starkly different from the drier conditions of the other side. This slope makes up the 32 acres of the DEC’s reserve, and it has the only conditions that the fern likes. There is one major area of the Split Rock lands that is now, regrettably, closed to public exploration – a high plateau variously known as Canada, Dry Canada or Canada Hill. This was a further storage and processing area of the old munitions plant, where vast quantities of explosives were stored at the time of the July 2, 1918 disaster. Many men died fighting the factory fire across the Gulf on that fateful night, when they might have escaped with their lives, out of fear that the fire would spread to Canada and blow western Onondaga County to kingdom come. The 250-acre Canada area is now heavily posted private property, but in the late 1980s I was up there and saw its many evocative ruins — industrial shacks, house foundations, unidentifiable bits of machinery. There also is a feature called Disappearing Lake (which has disappeared, duh). You can also see some 1980s photos of the area here. The fourth area of interest up at Split Rock is westward of the quarries and can be reached by the area’s major trail – the former Tripoli Landfill (off limits, but the trail passes by it) and the large lagoon known as Lost Lake. (Lost Lake is never actually lost — it is a permanent body fed by springs — but you may possibly be lost at this point…) The “lake” is home to fish and birds and probably lots of other water-loving creatures who are now happily and obliviously impregnated with PCBs and other stuff. Lost Lake really shouldn’t be there. It is fed by the upper reaches of the Geddes Brook, which is a major tributary to Nine Mile Creek – but Geddes Brook loses its way here and sinks into the ground. It’s thought that quarrying operations may have caused this disruption, or at least made it worse. The stream then takes a subterranean journey. No one knows its exact route, but the waters re-emerge at the bottom of the hill about a quarter mile away after just three hours, according to dye test. (During the “good old days” of Semet Solvay pollution, this underground seeping caused tremendous problems for farmers below the hill.) And after very heavy rainfall or snowmelt, Lost Lake overflows and cascades down the rocky hill and creates an interesting but rare show. Further west of Lost Lake, the old route of the Auburn-Syracuse electric trolley continues on to reach the Split Rock area’s western entrance at Kasson Road. The trolleyway is owned by Onondaga County but surely they don’t know what to do with it. Split Rock is such a fascinating place, so historic, so naturally interesting, yet so dangerous; how can you safely and officially welcome the public in without destroying what makes it special? There is no easy answer to this dilemma currently, and possibly there can never be any answer at all. The whole point of Split Rock IS its marginality, its stark ugliness, its tangled mazelike pathways and roaring overgrowth, its sense of danger and discovery, its relationship with deadly disaster and also with miraculous and improbable life. It’s not a place you want your kids wandering around unsupervised — and yet, it’s exactly the sort of place where occasionally wandering around could make your kid a better person. Aside from any acid-dropping kids or rampaging dirt bikers (or drone enthusiasts), some of the less scary marginal people you might meet at Split Rock, some of the riffraff, are the ghost hunters. Split Rock has gained a national reputation for being haunted, thanks to the 50 victims who lost their lives in 1918, and the Crusher is their point of pilgrimage. And the legend of paranormal activity has only grown, to the point where the entire Split Rock area is considered by some to be one big supernatural game reserve. But, being riffraff myself, I cannot exactly dismiss the views of the ghost hunters out of hand. Truth has a very tight relationship with fact, but not an exclusive one. The truth is that nobody ever visits Split Rock as a fully respectable citizen who accepts “normal reality.” The teenager and his friends have come to this space to drink, to smoke, to take drugs, to fool around and to do as they will. The dirt biker’s adventures are not allowed on the street — and the street is everywhere now, except for here. Even the people playing with their new drone toys, are eager to penetrate the heart of the unknown with their magic flying machines that can see all. The aim of our visit this weekend was not to climb the Crusher — plenty of other people have done that — or even to find the fern. We were on the hunt for an obscure old structure deep in the woods, variously called “the Tower of Silence” or “the Dog Dish” or “Swimming Pool” — the remains of a large vat from the TNT factory days, which once upon a time likely held a picric acid byproducts or human waste. Even though we GPS-marked the spot from aerial photos, in the summer growth the mystery feature proved to be inaccessible on the steep hillside, and we didn’t quite locate it (yet) — although we took a detour on one of the craziest, obscure trails I’ve ever been on at Split Rock or elsewhere. Sometimes the ghost hunters express disappointment with their experience, not having experienced or recorded the paranormal phenomena they seek. It’s probably not best to visit Split Rock expecting any peak experiences. Consciousness of the ordinary and mundane — and prudence where the risks of today are concerned — ought to be maintained. But, as I imagine is true of any pilgrimage, the point is not really to expect a transcendent experience or vision. The reason why people make pilgrimage to special places is to sustain them for many years to come out in “the real world.” A transcendent immediate experience is not necessary for this. It is unfortunate, though, that people spend so much time, money and effort on chasing “experiences” through travel, expecting these conscious epiphanies. Personally, I don’t see this as a promising form of travel, whether it is to an exotic faraway place, or even a nearby place. As for me, this visit to Split Rock was only my fourth one — I went there twice as a kid, once as a young adult, and now in midlife I visited it once more, and maybe if I’m lucky, there will be at least one more time after that. A lot of people who knew Split Rock well in their younger years, probably went up there more than I have been; but likely they have moved away, never likely to revisit. Others who feel drawn to the area (such as ghost hunters) may visit only once, seeking that special insight into their universe. No one bothered us on our walkabout, but that relatively easy access might not last forever. Someday, the area might be recolonized by industry or development, writing yet another new chapter of its overlaid histories. It could be that something sinister might happen here again (accident, or crime) that makes the area easy to label as a clear and present danger to innocents; a risk too great to tolerate by the non-riffraff citizens of the center — something that would precipitate a return of Officer Friendly. A more radical social solution to the “problem” of Split Rock could be to declare the entire area a DEC reserve. But that might require a sea-change in official thinking about what types of landscapes are morally acceptable and spiritually valid. When you live in one place for a long time, you develop a mental map of what is around you, a broader spatial awareness that stays with you at all times. I consider myself to be astonishingly fortunate to have grown up in, and still live in, a place where I can travel — on foot! — to actual blank space still remaining on the thoroughly overdeveloped map of civilization. Not a park, or “nature” — no: a real wilderness of ill repute. Perhaps this proximity to marginal space has greatly influenced my view of the world, and the development of my personality. Split Rock and all its strangeness was very real to me and my friends as children. And sometimes, we even still dare to go there.